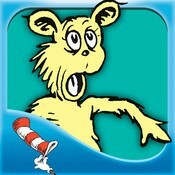 Description: A classic Dr. Seuss book that can now be purchased as an e-book – helpful in these last days of October if you need more Halloween books and have run out of time! It includes Read to me, read it myself, and auto play options. Why I like this book: This is a typical Dr. Seuss story that speaks about real feelings and relationships in the most inventive and silly manner! The unexpected ending supports new friendships. Music can play throughout story even in the read it myself mode. Discuss perspective and intent as you read the book exploring why the main character would be afraid of a pair of pants. Note that the fear builds with each experience. How does the character manage his fear? Language describing physiological responses to fear and stress such as “shiver” and “heart thumping” provide opportunities to talk about how our bodies react to fear and anxiety and how we can work to control it through deep breathing, yoga, and other forms of relaxation. The character lies about not being afraid when he clearly was. This is a good way to talk about why and how some lies are OK. This character felt calmer when he told himself he wasn’t afraid. Lots of absurdities in this book are fun to talk about – What’s real and not real; what makes a particular scene comical. Great book to talk about making inferences. You could stop the book and have kids illustrate or act out how they think the book will end. As an OT, I like to have kids act out books. It provides opportunities for sequencing, ideation, collaboration, planning, adapting, and it’s fun! Why I like this book: It’s a “play” on the classic “The Little Red Hen,” which is another favorite of mine. I love the lesson of the story, and the humor is loved by all children. 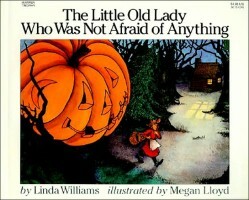 The story offers lots of fall, halloween vocabulary (pumpkins, witches, gremlins, bats, ghosts, etc.). Tie with Sara Smith’s Expanding Expression Tool and have children expand on the concepts. You can also use our Bag Game App and use the new fall and halloween pictures for description. There are various emotions/states and emotional vocabulary used in the story (frustrated, lazy, disgusted, excited, annoyed, etc.). Identify with students, and see if they can generate “why” characters feel that way. Can they “act” out the emotion? Can they identify a time in their life when they have felt that way? The story offers opportunity for students to infer what might happen next. If she plants pumpkin seeds what will she need to do next? (water) After that? (pick) etc. The witch’s friends also NEVER help her. See if children can predict what they will do/say next? Can they see the pattern? Can the predict how the witch will feel? Here is a free coloring page to go with the story provided by Charles Bridge Publishers: Coloring Page. Have students color, add descriptive words (use EET from above), generate their own story about a witch, etc. Lots of examples of the past tense. The witch lists what she has done often (I carved. I planted. I watered. I cooked, etc.) 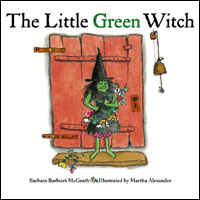 Stress the “ed” ending, and encourage students to retell the witch’s actions. There are numerous examples of /s/ blends throughout the story (scare, scooped, stirred, etc.) Encourage students to repeat your utterances, generate their own sentences using the stimuli, etc. Create picture cards that go along with the story to use for additional practice or home programming. Description: A walk in the woods turns into an unexpected surprise for the Little old lady. She meets some visitors along the way who follow her home to try to scare her. 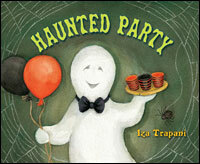 Why I like this book: It’s a fun holiday story that kids love to participate in. – use board maker pictures of all of the visitors she meets on her walk (e.g. Shoes, pants, shirt, etc.) They can add their part when it happens. The story is repetitive so there is lots of opportunity for participation. -a good story for the story grammar marker and Braidy (www.mindwingconcepts.com). A pretty straightforward sequence and clear kickoff. -act out each visitor. For example the shoes go clomp clomp… have kiddos stomp their feet each time. The pants go wiggle wiggle…have kiddos wiggle their bodies, etc. 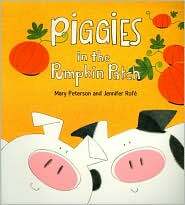 Description: Two young piggies explore their world by sneaking around the pumpkin patch while their mama sleeps. Their adventures bring them under, through, over, across, between… (you get the picture), objects around the farm until they land safely in the pumpkin patch. Why I like this book: Adorable illustrations make this simple story appealing for adults as well as children…AND it’s a fun book to act out. Read the book through once and see how many piggy adventures the kids can remember. 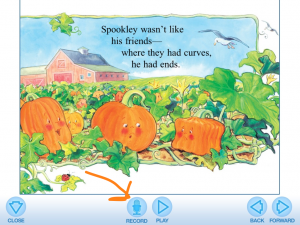 Ask kids to retell the story using temporal markers such as first, then, next, etc. Have kids use objects around the house, in the yard, on a playground or in a gym to set up an obstacle course that represents the actions of the piggies. A nice map in the front of the book can be used to help the kids re-tell the story and help them set up the course. Emphasize positional words such as under, over, between as kids move through their pumpkin patch obstacle course. Use deep breathing exercises to lower arousal levels as the “piggies” fall asleep in the pumpkin patch at the end of the story.